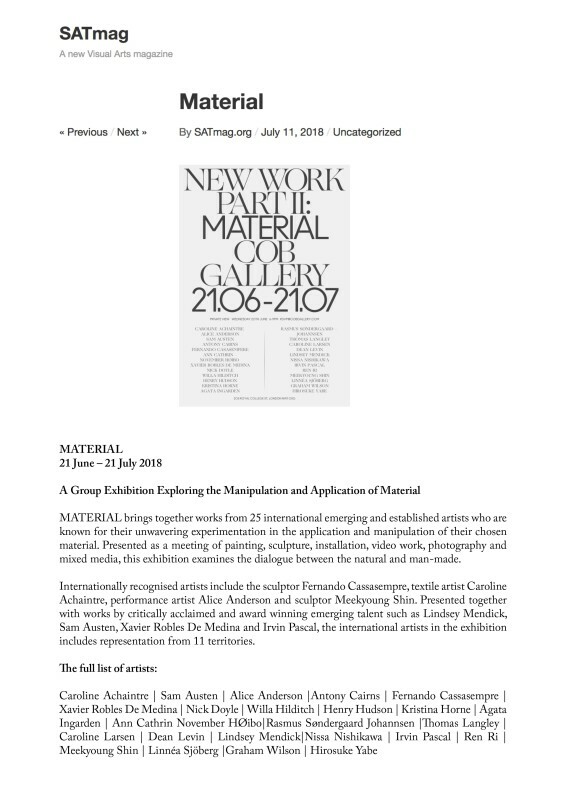 MATERIAL brings together works from 25 international emerging and established artists who are known for their unwavering experimentation in the application and manipulation of their chosen material. Presented as a meeting of painting, sculpture, installation, video work, photography and mixed media, this exhibition examines the dialogue between the natural and man-made. Internationally recognised artists include the sculptor Fernando Cassasempre, textile artist Caroline Achaintre, performance artist Alice Anderson and sculptor Meekyoung Shin. Presented together with works by critically acclaimed and award winning emerging talent such as Lindsey Mendick, Sam Austen, Xavier Robles De Medina and Irvin Pascal, the international artists in the exhibition includes representation from 11 territories.